Elizabeth Barrett Browning’s Sonnet 43. Previous Article TYGERS AND BOOGERS, OH MY! Such a cheesy parody. I’ll bet it’s easy to get you to smile for a camera. I like cheese baked into a cracker. I feel like you’re holding back on your love of cheese. Just let it all out. I gave up cheese several years ago to attempt to get my cholesterol under control. I dreamed of cheese. It was awful. I would salivate like Pavlov’s dog at the mere sight of cheese, in a magazine even. I’ve gone back to the cheese. There is nothing so delicious as a really creamy, nutty, aged Swiss unless you wave smoked Gouda under my nose! I love this poem (and cheese)! What? You couldn’t come up with a rhyme for “cheese enchilada”? Me neither. As a vegetarian, cheese is a mainstay in my diet. I’d love to go vegan but the thought of giving up dairy is just too depressing. I’d rather give up coffee or red wine.Thanks for luring me to your site with your comment. As a Wisconsinite, it is my privilege to officially confer on you the title of “Honorary Cheesehead”. Congratulations! That really is a nightmare. I don’t know how I would survive without cheese. Maybe you could try that Cheesewhiz stuff – I am fairly sure there are no natural ingredients in it. Congratulations. 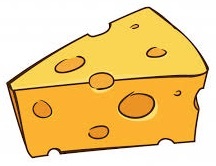 That was a Cheesehead test. You passed.